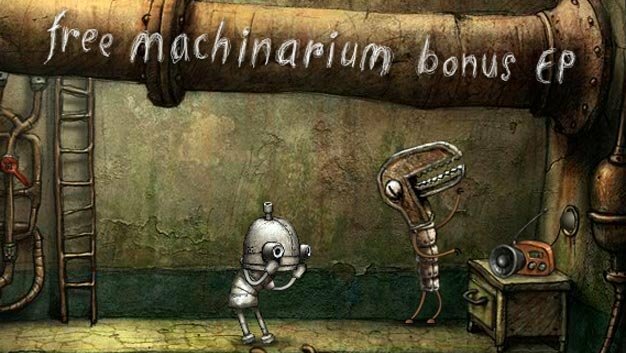 It’s pretty safe to say that we here at TVGB are huge fans of Amanita Design’s point-and-click puzzle adventure, Machinarium. If you read our review, you’re probably aware that we’re quite fond of the game’s moody, atmospheric music, too. So you can probably imagine our joy when Amanita announced that they’ve released a 5-track Bonus EP as a supplement to Machinarium‘s soundtrack. Composed and recorded by the talented Tomas Dvorak (aka Floex), these 5 tracks are not included in the game’s official soundtrack and are available exclusively on Amanita’s website as streaming audio or MP3 downloads (direct link). I’m especially glad they decided to throw in the ‘Robot Band’ tune, as it’s reminiscent of one of the game’s most memorable moments. ‘Pipe Wrench Dubstep’ is a close second, with its upbeat, wubbly bassline and funky kettle drums. All around, it’s just a fantastic selection of tunes. And did I mention it’s free? I honestly can’t think of anything more I could say about Machinarium that would convince you to buy the game and its spectacular soundtrack right now. But you really should. You really, really should.